In mid-June, in the space of just a week, Microsoft (NASDAQ: MSFT) unveiled plans to enter the hardware tablet market with Surface and Apple (NASDAQ: AAPL) previewed iOS 6 for iPhone and iPad users. Now, Google has taken the wraps off its Nexus 7 tablet, full-featured and positioned for the budget-conscious, running Jelly Bean, or Android 4.1 — the latest version of the OS. Aside from the obvious, what all three of the new entrants to the market have in common is not just that they’re cloud-connected: it’s that taken together, they push IT that much further down the road away from its desktop hardware beginnings, and, in so doing, by inference make clear that the channel’s evolution to a services-dominant (cloud services) business model isn’t just important, it’s inevitable. For its part, Microsoft has been urging its channel partners to the cloud for the better part of two years. Google, as The VAR Guy reported in January, has been collecting resellers for Chromebooks, the cloud-based netbooks, which now will be sold at 100 Best Buy outlets in the United States, with an associated expectation that those resellers will need to become more Android-familiar sooner rather than later to accommodate the tablet mobility services needs of business customers. And, while Apple isn’t regarded as an especially channel-friendly outfit, led by ex-Microsoft channel executive Francois Daumard as its iPad channel development manager, the vendor has quietly built a mobility practice and recruited partners for its Apple Consultants Network. Researcher Gartner forecasts global tablet sales will reach nearly 120 million units in 2012, a 98 percent increase from 2011’s totals, and another indicator of the stunning gains that tablets are making on desktop shipments. By comparison, Gartner figures that worldwide PC shipments for Q1 2012 totaled some 89 million, or a 1.9 percent bump from the same period last year. That makes tablet shipments, on an annualized basis, about one-third that of PCs. Not bad for a form factor whose lead dog, the iPad, is but two years old. There’s more. For the quarter ended Dec. 31, 2011, Apple sold 15.4 million iPads, topping the number of PCs market leader Hewlett-Packard shipped during the first quarter of 2012, and far outstripping Lenovo, Dell, Acer and ASUS PC performances during that period. If PC makers weren’t already shaking their collective heads, a just released Gartner study shows that users are accessing their tablets to check e-mail, read the news, see what’s up with the weather, social networking and gaming — all activities once the sole province of PCs. Never mind that we don’t know if Microsoft will allow its channel partners to sell any iteration of Surface or that Nexus 7 likely won’t be sold by channel partners and that Apple’s hold on the iPad isn’t very channel-friendly. In the larger vein, it’s not all that important. While tablets sales are close enough to PCs that the day is fast approaching when the venerable desktop and laptop will be truly a thing of the past, it’s not the tablet hardware but the associated services where the channel must be prepared to capitalize. What we are seeing ushered in is a whole new way of doing business, led by mobile and cloud-based devices. The concentration of power is among those device vendors who can make the biggest plays for the cloud, attract the most users, and garner the strongest relationships with high-performing channel partners. 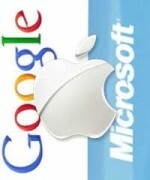 For now, Apple, Google and Microsoft, by example, are among those showing the channel the territory ahead.